I made a faux hammered tin planter, using aluminum foil, Mod Podge and black paint. Oh, and I did it on planters that the dog chewed up as a puppy. We will discuss my hoarding tendencies and inability to part with anything (chewed or not) at a later time. As you can see, the dog chewed the crap out of the sides of the planters. 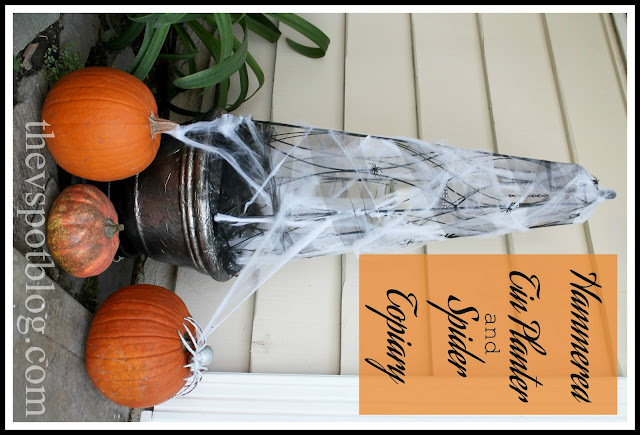 Covering the chew marks was what made me think to use the aluminum foil. I tore strips of foil and used a liberal coat of Mod Podge to adhere them to the planter. Because it kind of crinkles as you put it on, the foil masks the chew marks. When the Mod Podge was dry, it was time to dry brush on some black acrylic paint. 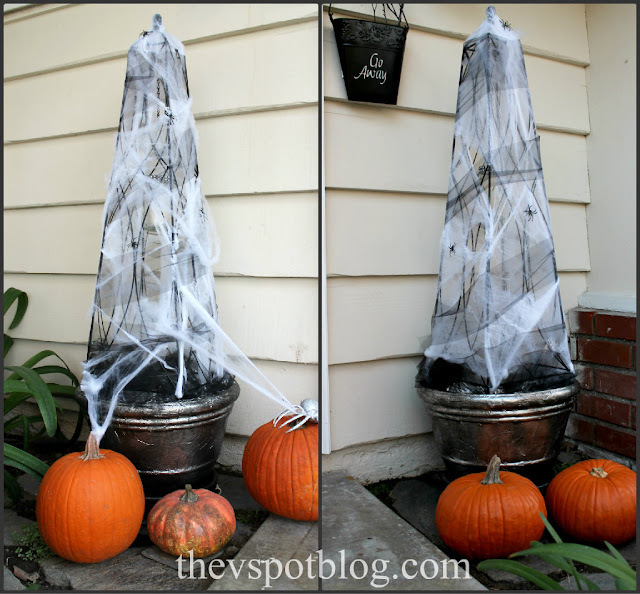 I wrapped the obelisk in fake spiderwebs (These are TOTALLY non-flammable, by the way, so no worries about having the tea-light candle at the bottom of the jar), then in some black tulle, and added a few plastic spiders. 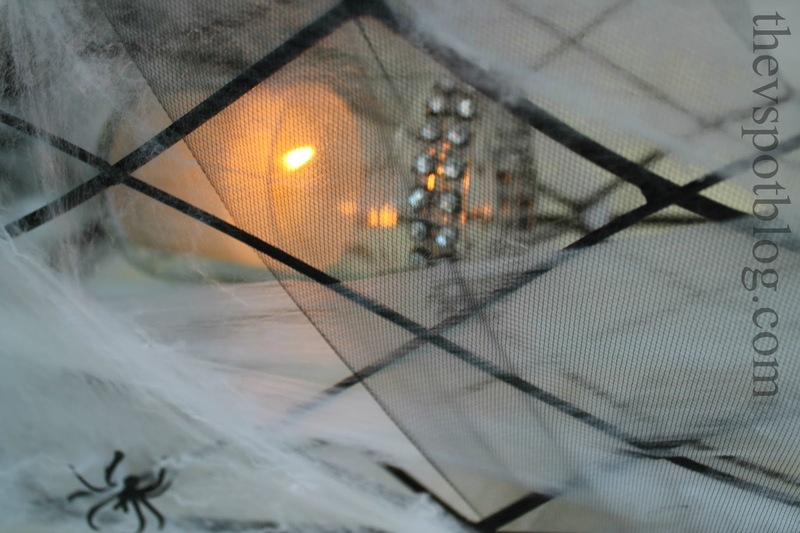 I’ll post more photos on my Halloween Party Wrap Up on Monday. 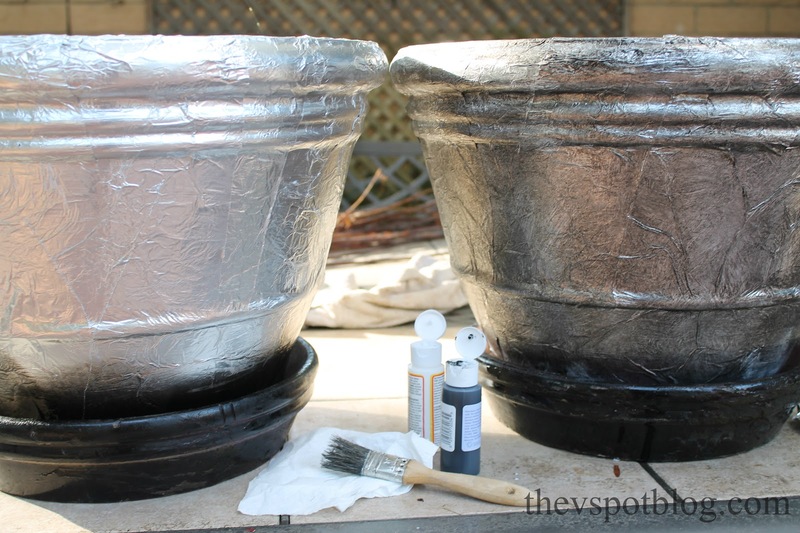 In the meantime, I am happy with the way these faux hammered metal planters turned out and am so glad they no longer are all chewed up and grody. Have you flame tested the validity of this non-flammable claim? Not that flaming topiaries wouldnt be super cool… im just saying. I wanna do something with foil, paint and mod podge now!!! 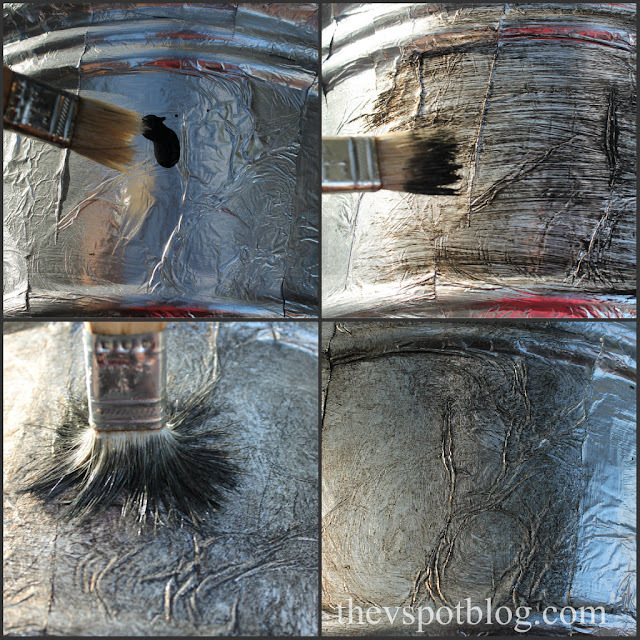 I love how the pots turned out – what a great idea with the foil, Mod Podge, and black paint! Can’t wait to see more next week! Love!!! I have to try it!